C-1. Habit: 0 = erect; 1 = apically arching/pendulous; 2 = clambering/scandent; 3 = twining; 4 = decumbent. C-2. 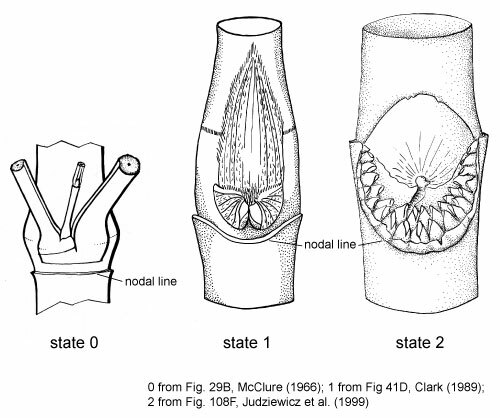 Culm internodes: 0 = all solid (at least when young); 1 = all hollow; 2 = some proximal internodes (including the basalmost ones) solid, distal internodes hollow. C-3. Wall thickness (ratio of 2X wall thickness: culm diameter): 0 = walls very thin (ratio up to 0.15); 1 = walls thin (ratio 0.16-0.30); state 2 = walls moderately thick (ratio 0.31-0.45); 3 = walls thick (ratio 0.46-0.60); 4 = walls very thick (ratio 0.61-0.99). C-4. Lacuna size: 0 = lacuna large, > 1/3 the diameter of the culm; 1 = lacuna small, < 1/3 the diameter of the culm. C-5. 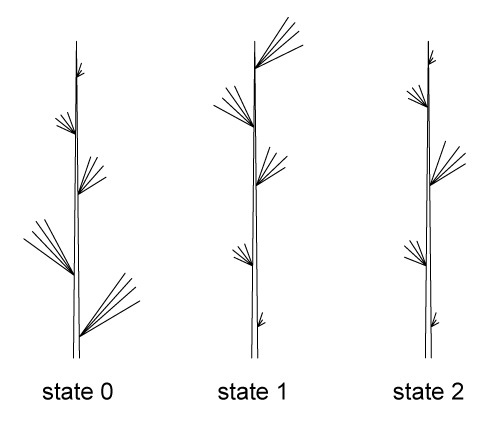 Vegetative culm branching: 0 = present; 1 = absent. C-6. 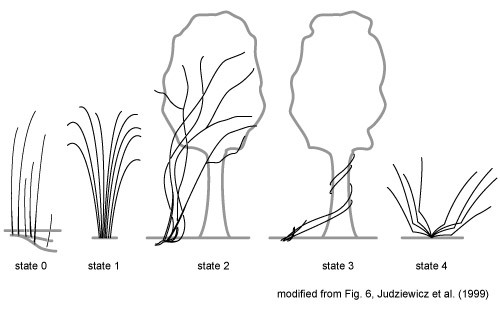 Branch initiation/development: 0 = acropetal (toward the apex, i.e., branching begins at the base and proceeds toward the apex); 1 = basipetal (toward the base, i.e., branching begins at the apex and proceeds toward the base; 2 = bidirectional (starting at mid-culm and proceeding toward the base and toward the apex simultaneously). C-7. 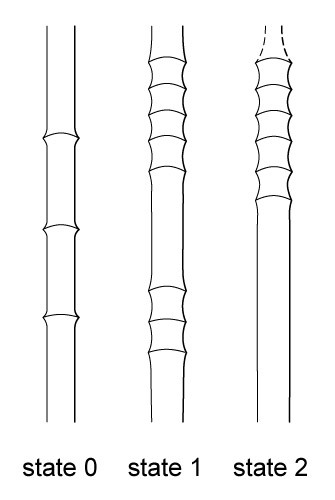 Internode length (relative): 0 = all internodes more or less equally elongated along the culm (excluding the normal variation in size between basal/apical internodes and those of the mid-culm); 1 = one elongated internode regularly alternating with 1 to 4 very shortened internodes; 2 = the first internode greatly elongated (up to 5 m long) with additional apical internodes (if present) very shortened. C-8. Nodal line position: 0 = horizontal; 1 = dipping slightly below the bud(s); 2 = dipping markedly below the bud(s). C-9. 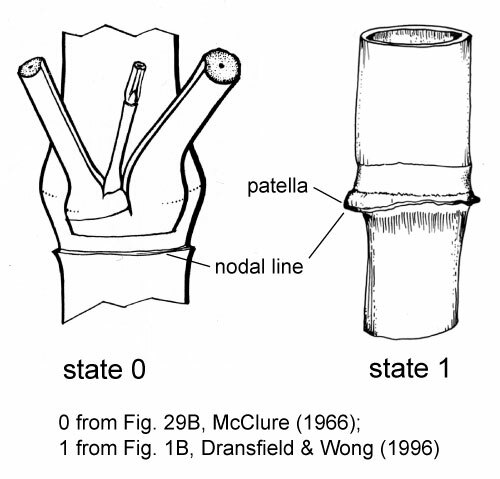 Nodal line diameter: 0 = more or less the same diameter as the adjacent internodes; 1 = borne on a flange-like extension (patella), its diameter greater than the adjacent internodes. C-10. 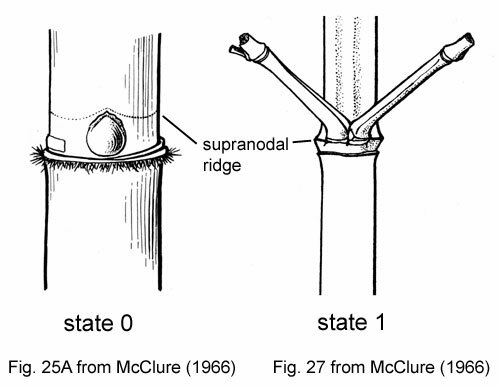 Supranodal ridge: 0 = inconspicuous (a line, diameter less than at the nodal line); 1 = conspicuous (a ridge, diameter equal to or greater than at the nodal line). C-11. Aerial roots: 0 = absent; 1 = present on the lower nodes only; 2 = present on lower and upper nodes. C-12. 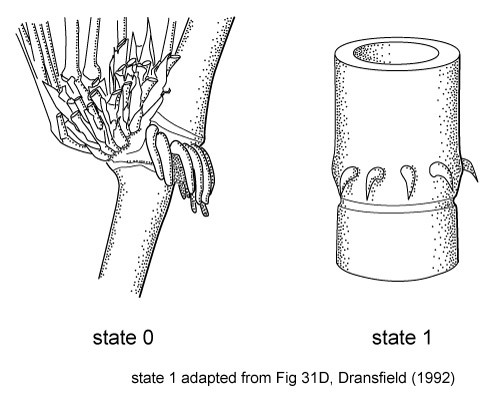 Aerial root morphology: 0 = root-like (more or less elongated, firm, and rounded at the apices); 1 = spine-like (short, hardened, and pointed).